You don’t need to look very far these days to find news of another tech company venturing into the tablet market. Since the launch of Apple’s iPad, manufacturers have been scrambling to push devices out to capture a share of the emerging tablet market. The tablet will be powered by Intel’s Atom mobile processor and will allow users to connect the tablet to an external keyboard or monitor. 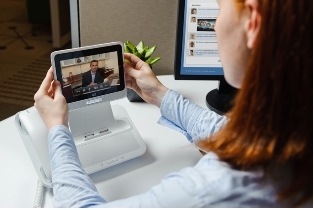 You can read a lot more about Cisco’s new tablet device here. The Cius could be looked upon favorably by the IT departments of big corporations for the sheer number of business oriented features it possesses, the open nature of its operating system and the fact it’s manufactured by a company with huge corporate support. Doesn’t quite have the good looks and the style of the iPad but this is shooting for an entirely different market. What do you think? Hit us up in the comments.